Bucks® Fabricating offers a large selection of Dewatering and False Floor products are used for a variety of applications including dewatering sludge, grease trap waste, industrial waste, septic tank waste, contaminated soils and more. 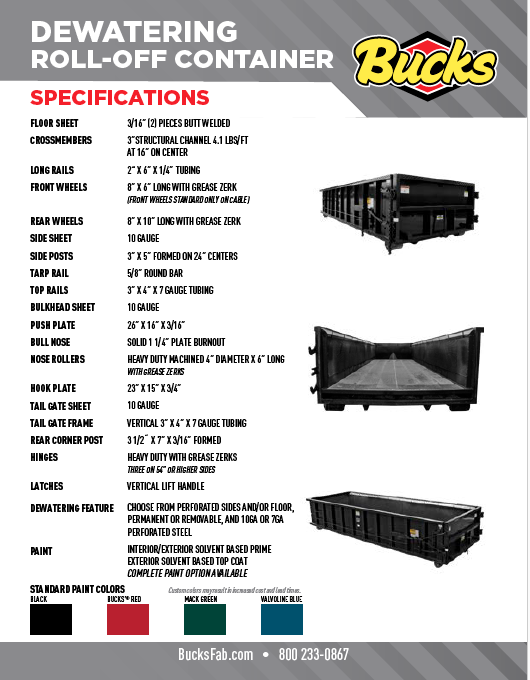 Our Dewatering and False Floor roll-off containers are ideal for waste haulers. The dewatering component of these containers allows the hauler to separate solids from liquids and then drain the liquid from the container. This decreases the container payload and saves waste haulers money at the landfills.